ASCON GmbH was the first company in Germany to establish a nationwide, independent disposal structure for out-of-date medicines. Within the scope of the extended producer responsibility concept, we recover expired medicines and recycle their packaging. Besides expired medicines, we also collect used batteries, paper and cardboard retail packaging and fully empty plastic packaging (blister packs, tins, rigid and flexible tubes) and arrange for them to be recycled. 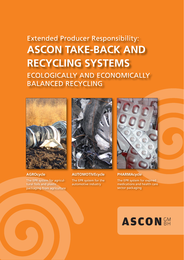 ASCON has developed the concept for the collection and recycling of these materials and now takes over the complete recycling process from the pharmacy onwards, thereby ensuring that the individual materials and components are successfully recycled in a way that meets all quality standard system requirements. ASCON GmbH also successfully collects plastic agricultural films either directly from local farmers or in cooperation with machinery rings or Raiffeisen cooperatives throughout Germany. Again, these are valuable secondary raw materials that should no longer be burnt. We offer farmers and larger accumulation points the option of pressing plastic films and packaging directly on site with own mobile presses so they can subsequently be turned into high quality reusable materials. Besides plastics, we also take back and recycle batteries and tyres. Until a few years ago, there was no waste disposal structure in place for automobile repair shops. The reason generally given for this was that this waste is often difficult to recycle due to contaminants, substances that may adhere to it and potentially hazardous contents. Films and other materials are therefore often disposed of only by burning them – which is definitely not in line with the urgently needed sustainable handling of raw materials. Over the past few years, ASCON has developed an alternative concept for the collection and recycling of these materials and now takes over the complete recycling process from the accumulation point onwards. This has been made possible through the establishment of a system in cooperation with car repair shops, car dealerships and other automotive industry branches. We not only collect the secondary raw materials usually produced by the automotive industry but also packaging from central collection points or directly from the repair shops under consideration of all legal requirements. The aim is to implement more efficient recycling by pre-sorting the materials. We offer car repair shops and larger accumulation points the option of pressing plastic films and packaging directly on site with their own mobile presses to then turn them into high quality reusable materials.